This morning I helped kick-off Earth Week in Las Vegas by volunteeringn for a few hours with the Flamingo Wash clean up. The event was organized by the Sierra Club and the local chapter of the Laborers International Union, and about 50 people showed up to volunteer. The Flamingo Wash comprises 77 acres of undeveloped land, and is only about 2 miles from where I grew up. Sadly, the parcel has become a dumping ground for all things people wish to dispose of – mattresses, appliances, cigarette butts, cans and bottles that could otherwise be recycled. The intricate wash system ultimately drains into Lake Mead, causing tremendous pollution in one of the major sources of drinking water for the Las Vegas valley. I’ve never understood why people do random dumping like this, when we pay for trash pick-up service to our homes. This parcel of land is also home to a community of homeless people who have established a tent camp, as well as a colony of ferral cats. Additionally, the wash is home to the Las Vegas buckwheat, which is now listed as a sensitive plant species. Clark County is now planning to build a community park on this site. As one who finds the desert landscape beautiful, I hope they keep some of the original landscaping in the park’s design. In the 3 hours we worked today, we were only able to make a small dent in the total amount of trash that needed to be picked up. But I was pleased to have been able to fill 4 trash bags with material that can now be recycled. The clean-up today was among the first in a week-long series of events to celebrate Earth Week. For a calendar of other events in southern Nevada visit www.earthdaylv.org. 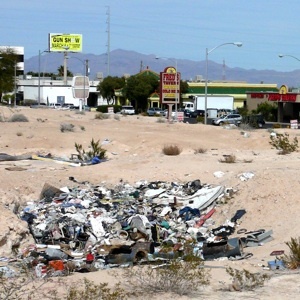 This entry was posted in Becky's Activism, Green Living, Las Vegas and tagged activism, community service, Earth Day, environment, Las Vegas, pollution. Bookmark the permalink.